As a leading provider of stables and sheds in Perth and other Australian locations, we at Action Sheds Australia are quite prudent and careful in finding the right “partners” who can help us provide the excellent products and services that we are known for. When it comes to stables, we’ve found the right partner in Durastall. With the help of Durastall, we have been able to supply clients with world class stables that offer more than just usability to users. And for that, we are quite grateful. For more than 15 years, Durastall, through the efforts of its engineers and designers, have been able to produce an efficient stabling system that brings various benefits to their clients. Through their innovative and advanced system, the company has been able to enhance the usability and features of its stables, ultimately leading to greater safety for horses. Accordingly, this is what has turned the company into one of the most trusted names in the industry. Durastall has supplied various stables to the most established stud farms in the country, from New South Wales, Bylong Park, Queensland, Victoria, Melbourne, Perth and other locations. Internationally, the company has been steadily increasing its ground and is known for providing some of the most top-notch stables around. In fact, this is probably the reason why it was the main stable supplier for the Sydney International Equestrian Centre, the venue where the 2000 Sydney Olympics was held. Presently, Durastall is exporting stables and accessories to Japan, United Kingdom and many other countries. And with the way things are going, this number of supporters and clients is expected to increase within a short period of time. With its advanced and superior technology, Durastall has been able to give stables that are durable, safe and designed to withstand the harshest elements. This undeniable efficiency of Durastall stables can be attributed to the company’s special manufacturing system, wherein strong materials have been made even more durable and safer. Each stable manufactured by Durastall makes use of high-quality steel, which is then “hot dipped galvanised” for added durability. Its stables are fully protected against corrosion, thereby making it even more efficient. Even its stable welds are hot dipped galvanised to prevent rusting and depreciation and to maintain aesthetics. Stable owners, and even their horses, can rest assured that they are using stable quarters that have been built to keep them safe. After all, one of the most paramount considerations of Durastall is to ensure the safety of horses. All of the company’s stables have the necessary safety features, including durable and high-strength stainless steel doors, as well as foot latches. Each stable has been designed with no sharp edges to ensure the safety and comfort of the users, while its frames have been specifically built to withstand harsh conditions, in order to provide greater protection for horses. Durastall stables are quite versatile, as they can be used separately or “free-standing,” or to supplement an already existing structure. These stables can also be used as a shed, barn, or for other purposes. In effect, Durastall stables can be used for large commercial purposes or to help in small farming operations. Either way, these stable options are bound to deliver on its claims. In addition, Durastall offers various stable accessories and add-ons meant to give additional security, protection and convenience, both for horses and their owners. Rotating stainless steel feeding bins, which allow feeders to feed the horses without having to physically enter the stable. Rug racks made of stainless steel and other durable components. These are just some of the qualities of Durastall that has turned them into the name that they are today. And these are the same advantages that we at Action Sheds Australia have been providing our clients. 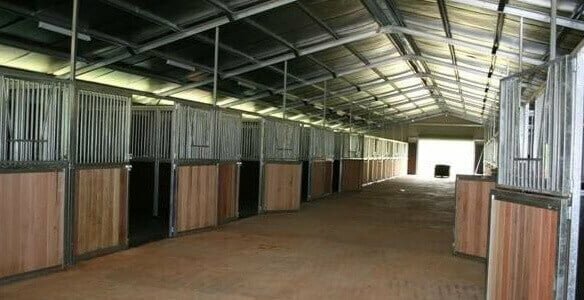 With Durastall’s efficient stabling system and Action Shed Australia’s prowess and expertise in the field, our clients can reasonably expect that they will get the stables that they have been looking for. Whether it may be added protection for your horses, more convenience, or greater durability and affordability for you, we can provide them all. Just contact us and we’ll be glad to help. Are you looking for durable stables to build on your Perth property? Call 1300 778 628.